Look stylish and eye-catching at the pool with this Mad Wave Men's Swim Brief! It utilizes a unique & fashionable design which will help you stand out at the pool! This MadWave brief gives the perfect balance of durability and comfort to make it the only men's swimsuit you will need in your swim training, fitness and leisure needs! This Mad Wave adults swimming brief / trunk is made from a chlorine resistant fabric which not only is provides excellent longevity but also gives exceptional colour and shape retention which makes your men's swim brief looking like it's brand new for longer, get yours today! The Mad Wave Swimming Briefs features a stylish print and are long lasting due to the chlorine resistance fabric they are constructed from. These durable swim trunks / briefs offers excellent protection from UV rays, fading and have exceptional shape retention making this MadWave Brief the perfect men's swimsuit for your training, fitness and leisure swimming sessions! This Swim Brief is part of the Mad Wave range of sports swimwear collection. 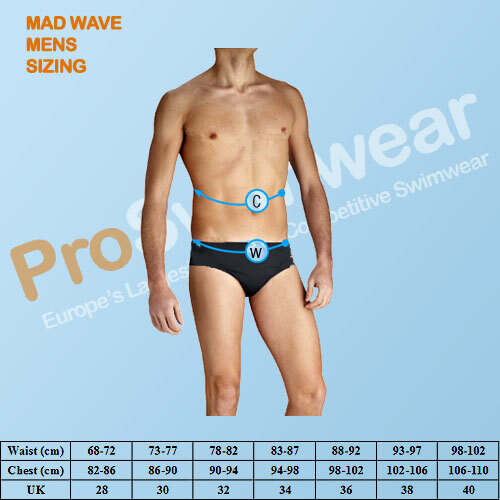 Mad Wave men's swimsuits are loved by swimmers due to their fashionable prints, slim & lightweight designs alongside their outstanding durability. The quality of Mad Wave swimwear is reflected in the overwhelming amount of positive reviews reviews they receive from customers worldwide in which the quality and the value for money of the Mad Wave range is constantly praised in. Get your new men's swimming brief or swim trunk today to find out why everyone goes mad over Mad Wave. Don't forget to follow the care instructions and rinse your MadWave swimwear in fresh cold water to get the maximum amount of swims out of your men's swimming suit! Men's swimsuit from the Mad Wave swimwear collection. Stylish high quality colour swimsuit print. Easily adjustable drawstring gives a comfortable, secure fit without negatively impacting your freedom of movement. Constructed from a highly durable Mad Wave fabric which allows this brief to last for hundreds of hours of swimming sessions at the pool! Chlorine resistant fabric prevents colour fading and improves shape retention, allowing your swimming brief to look and feel like brand new for longer.